Learning a foreign language can be somewhat difficult and requires dedication and time. We live in a world where globalization is growing fast, and the mixing of cultures is happening first. Am sure you may have found yourself in a situation where you were speaking a different language from another person, and the communication was cut short. It is, therefore, essential to learn another language and be diverse. One language that many people try to learn and have failed a couple of times is Hindi. The Hindi language is becoming popular among many people, and many want to grasp the language and speak it eloquently. While there is no shortcut on learning Hindi, there are some tips to learn Hindi fast. If you would like to learn Hindi fast and become fluent, there are some tips that you can follow to remember the words. These tips will help you in your journey as a Hindi learner and equip you with the tools that you need to communicate eloquently. The following are some of the tips to learn Hindi fast. Repetition is a great tool when learning a new language. Repetition will help you memorize the Hindi words better and help with your pronunciation. Ensure that you are constantly speaking, writing and reading the words over and over again until you get the grasp. The repetition of the words will make you more accustomed to the language. To learn Hindi better is it is important that you associate words with your surroundings. This helps with memorizing the words. For instance, you can associate a certain word with a drawing or a picture. This way, each time you see the picture, you can remember the Hindi word. One of the essential steps when it comes to learning Hindi is using it in your daily life. Do not wait till you get to your Hindi class to speak Hindu. Try as much as possible to incorporate it into your daily life. This can be as an out of class practice that allows you to grasp the language better. When learning Hindi, it is crucial that you also learn the roots of the words. You cannot just learn the words without knowing their basis or their context. It is thus essential that one learns how different words relate to each other and what their context is. One of the major steps to learning the language is speaking it frequently. If you are lucky enough to find a native Hindi speaker, it will greatly benefit your learning. Speak to the native speaker often to get a gist of how they pronounce the words. Learning Hindi is an ongoing process that does not end just like English where one learns new words every day. Each time you learn a new Hindi word, categorize it with other words that you are familiar with that relate to it. This will help you learn the new words and remember them easily. 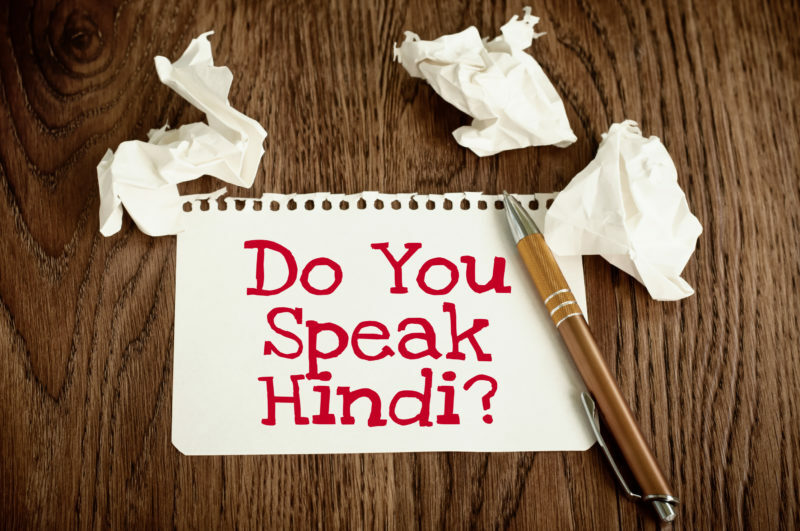 Learning Hindi requires you to be persistent and have the drive to want to learn every day. If you are not persistent and want to learn the language by not practicing or speaking it every day, you will take a longer time to grasp the words. You need to be persistent by talking to everyone and anything including a pet if you have one. When learning Hindi, it is important that you speak it aloud so that you can hear yourself pronouncing the words. Listening to yourself will help you realize if you are pronouncing them right or wrong. It also helps you gain the confidence to speak it boldly in front of other people. One way to learn Hindi quickly is to relate the Hindi words to the native language that you speak. Seeing that you are fluent in your native language, relating the Hindi words will help you understand the new language better and remember them each time you speak the native language. Learning Hindi can be fastened by listening to Hindi songs. Memorizing the lyrics to Hindi songs can help you get a better understanding of the language and how it is spoken. You can also try and decipher the meaning in the songs that you learn. If you watch Hindi shows that are designed for children, you will understand the words better. This is because such shows speak slowly and in a manner that children can understand. As a Hindi learner, you are also a child in the language and such shows you will relate to. For every new word that you learn, you can relate it to a movie or game that you have watched for better memory. This way, every time you get a glimpse of the movie, you will remember the Hindi word. When you learn a new word, use it in a simple phrase so that you can learn how to phrase full sentences. If you learn the words individually, you will not be able to speak fluently. It is important that you also turn your thoughts into the Hindi language. This will help you make Hindi more natural in that it comes to you naturally each time you want to speak and you do not have to struggle when speaking. If you follow the above tips carefully, you can become a fast Hindi learner within seconds. It may take some time and dedication but in the end, it will work, and you will be able to speak the language without any problems.